Note: Packing without wrinkles is something I've written about quite a bit, and I wanted to take some time to provide some updates. As a frequent traveler, I want to share some packing tips that have helped me stay free of wrinkles. 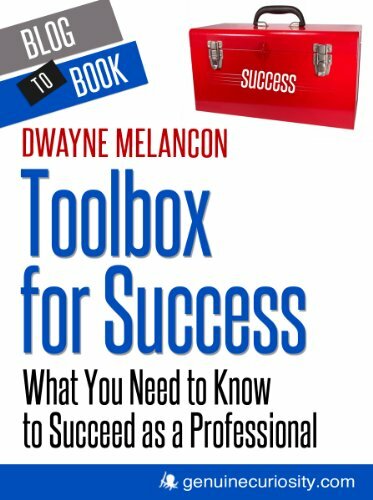 I have tried many methods including a classic method detailed on the Men’s Wearhouse site; steaming my clothes in the bathroom on arrival, voodoo, etc. None of these methods quite did the trick, even with wrinkle-resistant clothing (see my note at the end of this article). 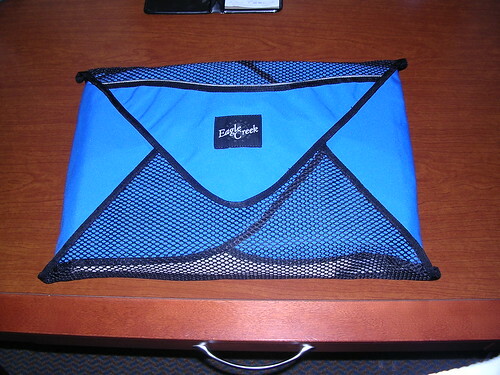 My wrinkle-free status improved significantly recently, when I discovered Eagle Creek’s Pack-It Folders. These are phenomenal for keeping dress shirts, pants, and jackets wrinkle-free in your luggage (they also work with skirts, but I haven’t tried that). Eagle Creek also offers Pack-It Cubes, which I use for general organization (you’ll see how it all works together to tidy up my suitcase, below). 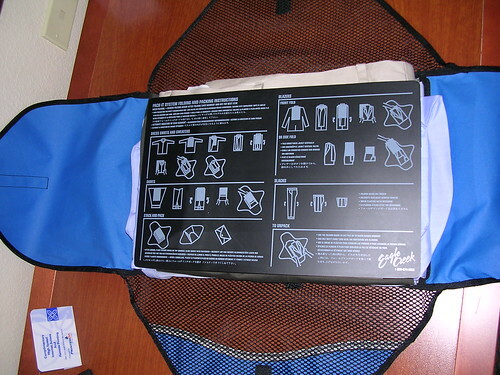 The Pack-It Folders come with a sturdy plastic folding board, which has detailed folding instructions printed on it. The diagrams on the board guide you through the folding process, and are very easy to follow. Start by buttoning a few buttons on the shirt (I button the top, third, and 6th buttons), smooth it out, and place it buttons-down on a flat surface. Then, fold the right sleeve across and fold the sleeve down at an angle, as shown in this picture. Next, fold the other sleeve across the folding board, then angle the sleeve down just like you did for the first – as shown here. 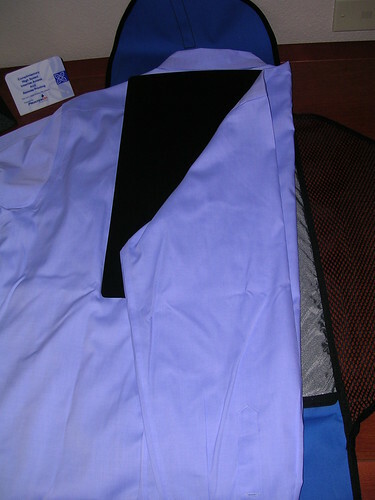 Next, fold the tail of the shirt up to the collar (the board forces you to fold it in the right spot), then flip the shirt over, place it in the center of the Pack-It Folder, and remove the board. You now have one neatly folded shirt. You can fold several and stack a number of shirts (the number depends on the size Pack-It Folder you are using). When you’re done, you place the folding board on top of the whole stack to help keep everything flat. Next, fold the flaps closed on the Pack-It Folder to make a nice, tidy bundle. The Pack-It Folder and the Pack-It Cubes work together to make a very tidy suitcase. And, when you reach your destination, you can unpack and things look almost as crisp and fresh as when you got them back from the cleaners. Click the image for a tagged version of what’s what in the picture. Note: For maximum effectiveness, I recommend buying wrinkle-resistant dress shirts and pants. I prefer Lands’ End or Nordstroms' line of "Smart Care" shirts as they come in exact sizes and are fantastic when it comes to shedding wrinkles. As a bonus, they are also stain resistant!